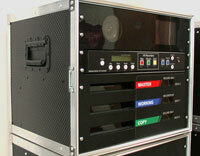 The Black Diamond Series 106 DVD interview system is our second generation DVD interview system. It still uses our separate hardware designed controller that has the skilled operator inbuilt. The controller provides the user interface, adds the analogue time/date, provides the user prompts and warning messages, has several analogue inputs/outputs for external microphones, internal microphones, camera(s), monitor outputs and UHF TV R.F. outputs (A legacy option that we still support), playback sound system and speakers. The Standard Series 106 system has the optional ability store up to 800 standard length interviews or to simply erase the interview once they have been successfully transferred to DVD. The Black Diamond Series 106 Interview systems can record for several hours without interrupting critical moments in the interview to change DVDs because they have reached their 2 hours record limit. The design like all previous designs has been future proofed allowing for cost effective future upgrades as standards and technology evolves. The series 106 interview units operate for 110 VAC ~ 240VAC input. They operate internally from 12VDC. All Melview DVD interview systems incorporate special dust free enclosures and are designed around ease of service maintenance. The S106 is a full size station all in one unit that has inbuilt full body camera and lens, 5” TFT colour monitor, up to three 24 * SATA DVD burners (a 4th full size burner can be added if required), 500GB SATA HDD. It is enclosed in a purpose built lightweight powder coated aluminium cabinet with a top carry handle. The total weight is only 9Kgs and dimensions 450 mm high, 200 mm wide, 260 mm deep. This system can be changed into a portable unit for both covert and overt interviews. Many of our customers have opted for the S106 as the portable model as long-term maintenance is less expensive as it uses full size DVD burners. The B106 incorporates all the features of the S106 system but has a reduced height and weight with the camera, R.F. modulator, 5” monitor and power supplies removed. A separate large screen monitor is provided and dome camera(s) used in the interview room. The total dimensions are 340 mm high, 200 mm wide, 260 mm deep. Plus the external monitor and 12V power supply. The P106 unit uses the same chassis as the S106 but uses a smaller camera and notebook SATA DVD burners and a 320 GB HDD. The total weight is only 4.2 Kgs (including the external power pack) and dimensions 280 mm high, 200 mm wide, 260 mm deep. The P106 is supplied with inbuilt microphones with the option of using the Series 106 external microphones. Designed as a 19” direct replacement for the Panasonic DVD recorders used in the Series 105 interview systems. It allows for all the newly developed interview Series 106 features and reduced maintenance costs to be cost effetely retrofitted to the older first generation interview systems using our unique RS485 media/recorder plug and play technology that was first developed in the Series 102 back in 1997. This allows the older systems to be 100% compatible with the networking and video interview transfer requirements currently evolving as network bandwidths within law enforcement agencies get upgraded.